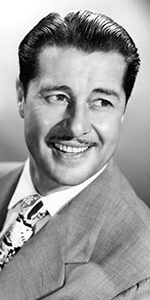 Handsome and affable, Don Ameche rose from vaudeville to become one of the most beloved stars of the 1930s and 1940s. His career continued into the television age, and he enjoyed newfound popularity in his 70s. Born to an Italian immigrant bartender father and a Scottish, German, Irish mother, Dominic attended Marquette, Loras College and the University of Wisconsin. Intending to study the law, Don was lured to the stage instead, and committed to a career in showbiz. After performing at Marquette, Don rushed in to replace a no-show actor in a stock company production of Excess Baggage. After playing in New York, he was hired to be a part of Texas Guinan's vaudeville act; she dropped him for being "too stiff." In 1932, he married Honore Prendergast, who bore him six children. They remained married until her death in 1986 (that's 56 years). With his new bride, Ameche headed for Hollywood. After a couple of extra parts on the Fox lot, he was tapped to play a double role with Jean Hersholt in Sins of Man (released in May, 1936). Darryl F. Zanauck must have liked the actor, for his very next film was to play the romantic lead in Ramona opposite Loretta Young (the film played the Chinese in September, 1936). Ameche's career took off. The Fox brass paired him with all their leading ladies: With Janet Gaynor in Ladies in Love (released in October, 1936), with Sonja Henie in her first film One in a Million (which played the Chinese in January, 1937), Alice Faye in both You Can't Have Everything (played the Chinese in August, 1937), and In Old Chicago (played in May, 1938). 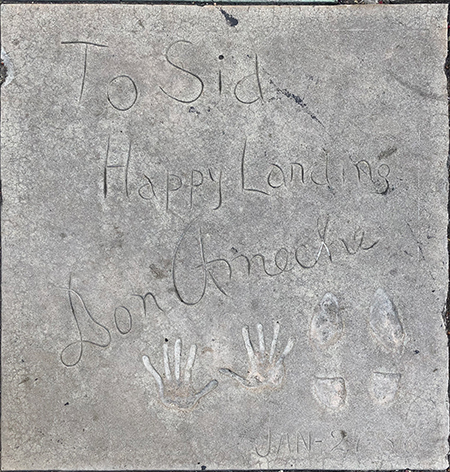 In fact, Ameche's second picture with Sonja Henie, Happy Landing was opening at the Chinese, and so, Sid invited Ameche to come and make his imprints in the Forecourt. Don Ameche played the inventor of the telephone in The Story of Alexander Graham Bell to such impact (when it played the Chinese in April, 1939), people began referring to their telephones as "the Ameche." Although Ameche wasn't a musical performer, he appeared in a passel of Fox musicals: Swanee River (which played the Chinese in December, 1939), Lillian Russell (played the Chinese in May, 1940), Down Argentine Way (played in October, 1940), That Night in Rio (played in April, 1941), and Moon Over Miami (played in July, 1941). Ameche was also featured in light comedies, some of the best of which are Midnight (1939), The Magnificent Dope (played the Chinese in July, 1942) and Heaven Can Wait (played in August, 1943). After World War II, Don became involved with developing the All-American Football Conference, and was team president of the Loa Angles Dons. The Conference disbanded in 1949. In the meantime, Ameche was forming a show for television: Don Ameche's Musical Playhouse (1950-1951 season), and The Francis Langford-Don Ameche Show (1951-1952 season). Ameche continued making the rounds guest-starring on various television shows: Burke's Law (1964), Petticoat Junction (1970), Julia (1969-1970), Columbo (1971), Alias Smith and Jones (1971), McCloud (1975), Quincy M.E. (1979), and Fantasy Island (1980). A real turning point came with his being paired with Ralph Bellamy in the comedy hit Trading Places (released in June, 1983). This was followed by a prominant role in Cocoon (released in June, 1985), for which Ameche finally bagged an Oscar for Best Supporting Actor. He made a number of features following that, such as Harry and the Hendersons (released in June, 1987), Coming to America (which played the Chinese in June, 1988), Cocoon: the Return (released in November, 1988), and Oscar (released in April, 1991). His final film, Corrina, Corrina (released in August, 1994) was released after his death from prostate cancer at the age of 85. Grauman's Chinese Theatre, Hollywood, California. Don Ameche Forecourt ceremony, Thursday, January 27, 1938. 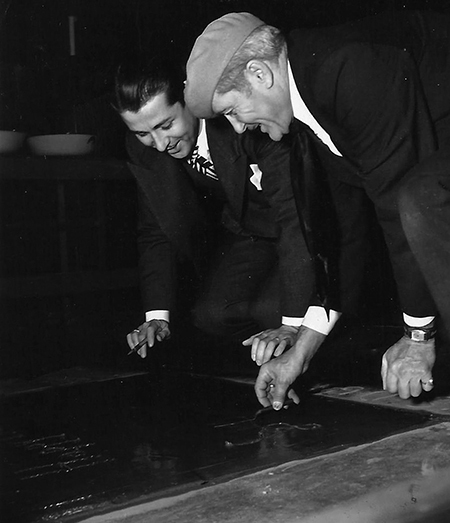 Don Ameche observes as cement artist Jean Klossner smooths out Ameche's autograph.